One of the things I’ve learned to love about being published is reading the work of those who are published alongside me. This is particularly true when the work I'm reading exceeds my own in quality. One doesn’t need to be the headliner, or to play the lead, to enjoy being part of a terrific collective performance. The moon is beautiful in itself, but it shines because it’s bathed in the radiance of the sun. 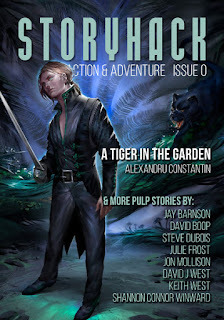 StoryHack Action and Adventure Issue Zero (my God, man, haven’t you read it yet?) contains no weak links, in my opinion. But every reader will have favorites, and there were three stories in particular that blew me away, and taught me valuable lessons as a writer. Jay Barnson’s “Dead Last” is wonderfully action-centric; it’s similar stylistically to one of those seven-minute single-camera tracking shots that directors like Scorsese work into their films. Setting his work in an underworld of magical agencies at cross-purposes, where wizardry and gunfire are equally effective tools, Barnson lights the fuse on page two, and the fireworks don’t end until his final, devilishly brilliant twist. For a writer like myself who tends to get buried in exposition and world-building, it’s a poignant reminder of the great lesson of the Pulp Revolution: readers read in order to be entertained. Julie Frost’s “The Monster Without”, with its morally-centered werewolf private eye, also brings plenty of slam-bang action to the table. Yet it’s in the quiet moments that Frost truly excels; the story is at least equally effective as a reflection on the importance of family, and as a portrait of an ex-soldier struggling with PTSD. Pulp fiction at its best is not a comic book, in which the consequences of violence can be brushed off or “retconned” away. Frost’s hero, like those of Joe Abercrombie, bears scars both physical and psychological, and pays a substantial price for the life that his code compels him to lead. Frost reminds us: a story’s not about what it’s about, it’s about who it’s about. Meanwhile, Shannon Connor Winward, author of the cranium-cracking “Daughter of Heaven”, obliterates utterly the false distinction between the pulp and the literary. In leading the reader on a chase across the colonies and craters of Mars, Winward conjures up horizon-spanning visions and strings together sentences that would be award-worthy in any publication. I dare you, reader, I double-dog dare you, to stare with Winward’s protagonist into the skies above Tikhonravov crater and manage to keep your jaw from dropping open. 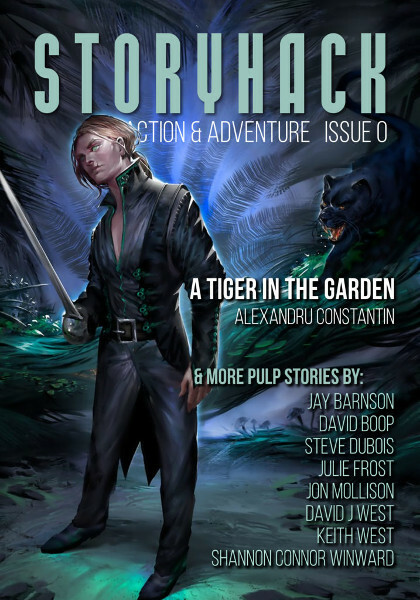 Winward’s story is a master class in imagery, and crushes any illusion that pulp holds writers to a lower standard where wordsmithery is concerned. What a treat to read such a collection. And what an honor to be included! It’s these achievements that a new writer clings to as the rejection notices pile up in glacial stacks. If I am thought worthy to share the company of these artists—published novelists, Writers of the Future winners, celebrated generals in the #PulpRevolution—then there must be something in me worth developing. The sidehustle is still on; the dream is still worth chasing. If support for the arts is important, then the StoryHack Kickstarter is a worthy means of doing so. I was delighted to donate, and to offer a new set of pulp writers the same opportunity I was afforded. Perhaps you’ll choose to do so as well. I am so happy you enjoyed it. Thank you! Just learned that the Kickstarter cleared its goal with several days to spare, in part thanks to donations from readers of this site. Thanks y'all! You've made it easier to be a writer. I live in Kansas City, where I write, teach, and coach competitive speech, debate and quidditch.